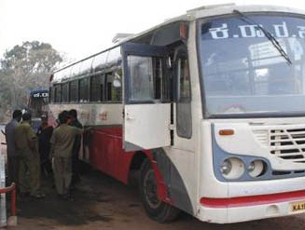 Padubidri, Dec 4, 2016: In a shocking incident reported, more than eight students from various private colleges in Mangaluru allegedly assaulted the driver and conductor of a bus at Padubidri during the early hours of Dec 3, Saturday. The accused have been identified as Kaushik, Nihal, Jovel, Chintan, Saurav, Akash, Aditiya, Hithesh and Dhanesh. It is said that after a party at night, they were on their way to Café Coffee Day at Yermal. They slapped drivers Girish Kumar and Jettappa and conductor Nagaraja Shetty. It is said that a Rajahamsa bus was on its way to Bhatkal from Bengaluru when the students arrived on four bikes at about 4.45 am. It is said that the students were riding on the highway and were not letting the bus pass. This began from Karnad, Mulky itself. However, bus driver Girish managed to overtake them near Bhavya petrol pump at Padubidri. The students then stopped the bus and attacked two drivers and the conductor. They police managed to arrest six while three are absconding. Three bikes were also seized. An FIR was filed and the accused are likely to be produced before court.